Ognibene is now approaching the new electric era and facing the technology with its new product DPS – Digital Power Steering, designed with the aim of the driver’s comfort and safety. Ognibene Power has been a leader in the design and development of hydraulic steering system components (actuators and steering units) since 1953. Beginning with the start of the millennia, the company has undergone a major global expansion by adding manufacturing sites in Brazil, India and China, a logistics centre in North Carolina (USA) and a sales office in Japan. 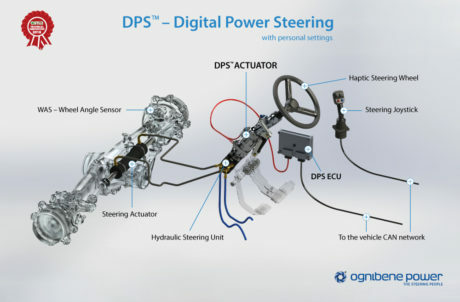 Steering products by Ognibene are used in many off-highway vehicles including agricultural tractors, construction equipment, material handling, lawn and garden equipment. Ognibene Power also has applications in the marine and automotive market. The company is well versed in industry requirements and regulations and takes pride in being a company who not only understands current trends, but also helps establish them. As new technologies emerge and vehicle designs continue to evolve, research and development in integrated systems become even more important. The DPS is placed over the traditional steering system in off-highway vehicles, improving maneuverability and allowing the use of GPS and autonomous driving systems without any additional external steering system. The vehicle equipped with DPS system, has a steering system fully homologated for on road use. When needed, GPS and auto guidance systems can be directly connected to the DPS. The driver has the possibility to override the system and keep full control of the steering by acting on the haptic steering wheel. The DPS system is a brushless electric motor integrated coaxially in the steering column, between steering wheel and the hydraulic steering unit. The integrated sensors inside the electric motor are designed to measure the angle and driver’s applied torque. This data is used by the DPS ECU to process the best steering response and related haptic feedback, based also on the vehicle speed signal and the position of the front wheel position. The DPS system introduces new smart functionality for on and off public road (it reaches an AgPL d – Agricultural Performance Level – ISO 25119), increasing safety, control, stability and precision at high speed, and allowing more comfort and agility at low speed. Thanks to the low power motor designed coaxially with the steering shaft, the system, first in the market, is born to be integrated in the steering column. 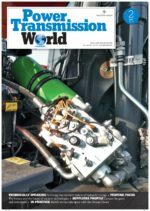 These features enable an ergonomic and easy assembling inside the cab rather than an electrohydraulic solution, which is mounted externally normally in the engine bay. Due to the brushless technology used, this system requires no maintenance. The DPS ECU is connected to the vehicle and GPS CAN BUS, making it accessible for GPS, steering Joystick and Radar/Lidar, which can also be connected through a specific CAN BUS. With the Steering Joystick is possible to do a fast spinning of the steering wheel at the end of the field to reduce driver stress and the total number of steering maneuvers in a working day. When the haptic steering wheel is used, the automatic wheel alignment on both directions reduces the driver effort by putting down the number of the steering wheel movements. Thanks to the modularity of the system, it is possible to have a full range of intelligent steering column with the same integrated DPS module. The DPS steering column is customizable with different type of regulations like tilting and telescopic workable with lever/pedal or remote disengage in order to obtain the best ergonomics and to fulfill all the constrains in the cab. With the DPS system is possible to change the feeling effort handled by the driver, making the steering stiffer or softer. Level of assistance can be speed dependent and selected by the driver acting on the DPS ECU settings through HMI device. The DPS reduces tension and stress on the repetitive driver’s work. It is estimated that, at low speeds, the effort on the steering wheel can be reduced by 75%, helping the driver to face tight bends, roundabouts and other demining, maneuvers feeling relaxed and confident. With the introduction of a new smart system on the steering is now possible to obtain new functionalities such as haptic signals (for example the steering wheel can shake in order to indicate a specific vehicle status) and customizable steering wheel feedback. The modularity and flexibility of the system allow to the OEM to fit the vehicle to the user needs. Ognibene Power’s focus is innovation and continuous improvement in manufacturing, operational efficiency, and product quality. The company is certified by TÜV NORD to ISO 9001, OHSAS 18001 and ISO 14001, as showing our organizational commitment to quality, safety and environmental issues. In 2011 Ognibene committed to the WCM program (World Class Manufacturing) to achieve excellence in logistics and production flows. The global team is a committed partner on steering systems with some of the world’s largest OEMs and remains dedicated to helping develop the steering systems of the future.